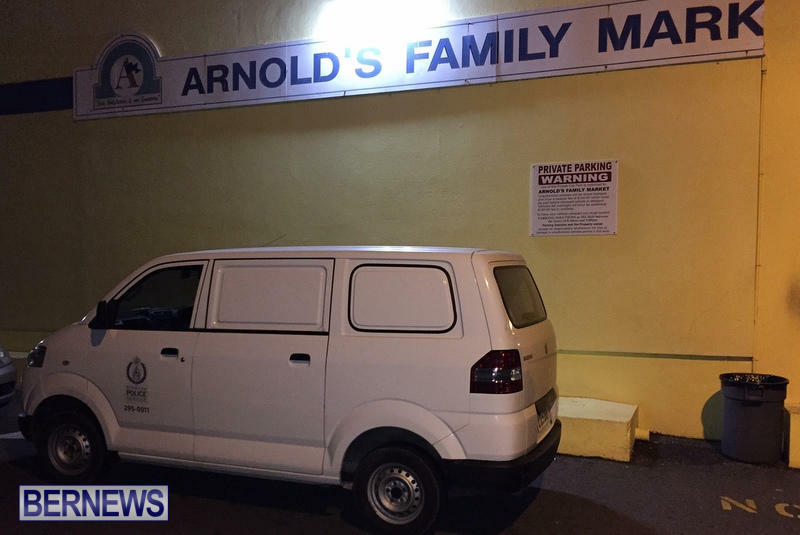 Police Media Manager Dwayne Caines said, “At 9:13pm on Monday night police attended a report of a robbery that took place at Arnolds Supermarket on St. John’s Road in Pembroke. “Details are still developing but it appears that a male entered the store and forcefully gained access to a cash-register while a cashier was completing a transaction and stole an undisclosed amount of money and then left the scene. “It is unclear if the suspect left the scene with the aide of a vehicle or on foot, also at juncture it does not appear that the suspect brandished a weapon,” said Mr Caines. “The store is now closed and is being processed by officers from the Forensic Support Unit and CID. The suspect is described as a tall brown complexioned male wearing a green track suit. There has been a spike of robberies against businesses in recent weeks, with incidents including the robbery of the gas station in Crawl, the armed robbery at Flatts gas station, the attempted robbery of Empire Grocery on North Shore, the robbery at Four Star Pizza in Warwick, the armed robbery at Southside Pizza House, the robbery at KFC in Hamilton and the armed robbery at the Island Spice Restaurant in Warwick. What the heck does that mean!? Sad but the store is very busy?? WHAT???? ironic that your name is “think about it”…. The spat of robberies have not taken me by surprise. There’s more to come. It is to be expected when unemployment is on the rise. To every action there is a reaction. It is also to be expected when a group of people become bitterly angry (hurt people hurt people) when they are shut out of the employment market due to age discrimination, forced retirement, and rapacious businesspeople and a government that is participatory (some of whom are also employers) and supportive of those practices, together with the evils of RACISM—the chief/king weapon of destruction of one group of people against another. Just count the number of foreigners at Arnold’s and the other supermarkets who are performing jobs that Bermudians can and would be willing to do,especially during this lean season where many unemployed locals would be grateful to take home half a loaf of bread. There being no room in Job Inn is indicative that charity does not begin at home with the UBP/BDA/OBA Government. If I were a political servant of the people of Bermuda I would always ensure Bermudians FIRST place in this community. Foreigners (contract workers) who are on contract here would be required to produce suitably qualified Bermudians to fill their positions at the expiration of their contracts. When missions are accomplished the contract workers would be issued a note of thanks for their services and bade farewell. This would resolve the contentious issue of the UBP/BDA/OBA granting Permanent Residency Certificates and Bermuda status to those manufactured long term residents. Back to the crime scene: The hunter who hunted is now being hunted by potential hunters too. When one is depraved of the basic fundamentals of life—food, shelter and clothing; coupled with a searing sense of hopelessness and helplessness, rest assured a fight for survival will ensue. There is a natural hunter in each of us when it comes down to survival. It is evidenced even in the animal kingdom. The hunter tendency is packaged in nature’s survival kit. I’m aggrieved over what precipitates events like that which unfolded at Arnold’s, as I overstand the whys of them; I am also sympathetic and empathetic toward the hunters. Bermuda, even I cannot—no, would not promise you a rose garden when I lack the basic fundamentals of life—food, shelter and clothing—coupled with a searing sense of hopelessness and helplessness. I would not expect any different of you either. Potential hunters too (those persons in positions of authority who are basking in the basic fundamental needs of life) must take their eyes off of the leaves of the tree of criminal behavior and closely examine its roots. There they will find the antidote to societal problems. New book details a young man’s search for employment when no one was hiring and how his grandmother’s ingenuity got him hired. It is also a key that unlocks the door to information regarding sacrifice, saving, self-pay and do-for-self suggestions to getting employed. Founder, Vision Coach Dynamics, Coaching and Consulting, U.S.A. Creator of the Big Brand Formula and Founder of the Big Brand Academy, U.S.A.
@ Think about it. Since you can’t be bothered to think, here’s the breakdown for you. ‘This is sad, but because the store is so busy, hopefully someone would have witnessed this and they are able to catch him’. Pretty simple if you THINK ABOUT IT! Innocent persons have been put out of their jobs…. the word used is RESTRUCTURING. Sorry, about Arnold’s loss. THAT IS ON THE ONE HAND…ON THE OTHER HAND, INNOCENT PEOPLE HAVE BEEN MADE redundant. Well, guess who have now fills those same job spots?? Somebody who is educated for the job? The missing $800m could have been feeding a lot of families these days… I’m sure Beyonce will come to our rescue though! That is the dumbest comment I have seen on these blogs in years! One has nothing to do with the other – - some mother’s do have dem! It’s called, I am here or hired to deflect. One thing for certain, Rhonda, we’ll never forget the debt the PLP put us in. The fact is the reason why this island is struggling is a direct result of the PLP’s legacy of mismanaging the economy. And that’s putting it mildly! The P.L.P. were met with massive incongruencies from the ubp.No critic mentions that!! The ubp left the P.L.P.IN A BIND…. oba has attempted to demolish BERMUDIANS. oba is the WORSE of the two parties! If what you are saying is true, then how did the PLP help the situation during their 14 years in power? The plp were met with a growing economy and money to spend. What are you talking about? Where did you back anything up with fact? Also a backbone doesn’t work without a brain…jussayin. I can tell I’ve struck a nerve. Justin, you are abusing your freedom of expression..
God forbid he talks about Beyonce. smh, we need to get this pieces of scum off our streets. Let’s see if Premier Dunkley appears and at the very least condemns these acts. Doubt it though. I prefer Baron. Easier on the eyes. Sarcasm folks! Sarcasm but oh so true….. There is a lot of agreement to your comment. GOOD!!!! If this government had a solution to get this country back on track crime rates would likely start falling, rather than continuing to rise as they are. @truth and unimpressed, that trick of the plp support base to post under various names was caught onto a long time ago!!! Agree 100%, if we started punishing properly, these worthless thugs would think twice. They are not looking for jobs, just hand outs. How can people be so dumb to think this has anything to do with goverment. We need tougher laws, that is the governments fault! We dont need people like you here. Please move to North Korea were that would be deemed a reasonable and justified punishment. Also, how do you know that the men committing these offences dont wish to work? a. Dont really care because you would have helped if you did thus making you a part of the problem. If you dont than pi$$ off with your bulls#!t because you obviously dont know what you speak of. Do YOU know any of them..? You’re putting your reputation on the line trying to rationalise what these lot are doing…are you deaf dumb blind and stupid…these guys are f#@king up YOUR island and it will affect YOU and ALL who you know when the FOREIGN dollars which are already dwindling comes to a complete halt…then what..? Haiti?…need I say more?. One thought…If you prevent me from getting rich, how can I hire your services…y’all too busy rebelling instead of gelling. These guys do not want to work – they are sitting off on a wall all day, harassing people and expect everything to be handed the them because they are Bermudian. These crimes have noting to do with the state of affairs in this country. These crimes are being perpetrated by thug that don’t want jobs. Stealing money is just to easy. Sadly there will be many more to come. @Truth. Give this government the chance it needs to help us recover. If you lost 2.5 billion what would you do? We are in debt up to our eyeballs. I think the island’s crime rate would drop if we reinstated just one job at the prisons. The Hangman. One full day with them back doing their job will not only cut down the prison population and cut reoffenders of violent crimes, but serious reduce what we pay to keep prisons living more comfortable and sercure lives then we the people who have to pay for it. You all still think this is just criminals doing criminal things and not directly correlated to poverty and lack of jobs but hey, at least those billionaires are here to race their toys! OBA sure makes good on their promises. I work two jobs, TWO that I found on my own with a high school education. I am Bermudian, middle age. I don’t love these jobs but I have the opportunity to make money, save money and add to my CV until something better comes along. So no, it is not lack of jobs – it lack of ambition. really? the government to have a solution? I think they always have a solution. the people of bermuda have a solution. solutions are ideas that Dont always work. solutions are supposed to solve a problem; a fix to a problem. there is only one real solution and only God has that solution. we can only prolong peace for so long. but because of our disobedience to God we are creating the problem. and because we refuse to obey God sin is a reproach to our nation instead of letting righteousness exalt the nation. so we see the inevitable direction of this nation and even this world leading to the time of trouble such as never been seen before that if it wasn’t for God to shorten those days no flesh would be saved. but for the righteous sake those days will be shortened. he will stand up and say enough is enough. I gave you a chance. so whoever is righteous be righteous still. whoever is wicked remains wicked. my reward is with me. I come quickly to give reward whether good or bad and put a sudden end to this madness such that I shake the heaven and the earth. and the world would acknowledge that I am alpha and omega the beginning and the end. the lion of the tribe of Judah and there is none besides. I have a great new business idea: selling bars for windows. They will be the norm soon enough. Very sad what Bermuda is becoming. People will once again leave in droves and this time they won’t come back. Bermuda is headed for the third world. Not enough jobs, go figure! I’m sorry but you people are so f#@kin stupid!..NO govt.can stop crime such as these random acts…UNLESS it imposes MARTIAL LAW…Im sure y’all will welcome that with open arms…We need to kill the VIRUS in order to survive. Why are you trying to give the impression you are two separate people? He is in two minds about that. It’s not so much the Government that’s “coming up short of the line” as much as it’s the citizens of Bermuda. There are countless crimes going on daily, people know in many cases who are responsible individual/s yet they turn a blind eye. I agree, like those who watched that 8-yr old get mangled by a dog and didn’t help! This island is shut! No one willing to help, especially if it causes any discomfort to themselves. Help is needed, yet help won’t ever really come; when you look the end will be here. It will be very interesting to see Micheal Dunkley cry again over spilt milk . Meanwhile there will be a meeting to give Bermudian status to a group of privileged , mostly white people , while born Bermudians are continually squeezed out of the economic fortunes of this country ! Behavior like this exposes the discontent running rampant in the community and the answer from the government … Give Bermuda away to the residing foreigner ! How do you know they’re mostly white and/or privileged? Was the data released that only you’ve seen?! SMH…go back to bed! As far as um concerned even the “poor” or “lower class” people here are not….we have one of the highest GDP’s in the world…go find out what a REAL SLUM looks like! Yes times are hard, people are struggling bad, but at the end of the day we’re all still pretty privileged and blessed! Also not all born Bermudians are black FYI! Truth….do you think there’s a magic wand to be waved to get this country on track! Bermuda is small and opportunities are there for those willing to work. It starts with preparing ones self. The Government is doing a lot against a tide of negativity and pure stupidity. When are people going to realize that this is not a Government problem. The same way it takes a village to raise a child…it is going to take the WHOLE community to put an end to the nonsense. Until people are willing to come forward with information this stuff is going to continue. These culprits do not live in a bubble….someone somewhere knows something. My thoughts are with the cashier who no doubt must be shaken. The person/s who did the crime. It is not just up to the government but also us as citizens!! Someone somewhere knows something andnot saying anything… People see and keep quiet. Also..where was security? Always see them outside smoking or flirting…or inside having deep conersation! At this particular point in time do you really think the crimes being committed have anything to do with any particular administration being in power.What you see going on in Bermuda is that the children(thugs)are running the house(streets) and it’s time to grab them by the scruff and take them out the back.And for the parents of these thugs that cry foul play beat them after.I bet that if a child committed a crime and the parents had to appear in court you would see a dramatic reduction in juvinile delinquency. Most businesses do not have a uniformed presence, and part of the reason is it is quite expensive, and another reason is they are not licensed to carry fire-arms, use tasers or tear gas. In fact, we are now beyond the taser sta ge. Whether its a security officer or police officer on duty, there is the great risk of harm, and in the interests of better security an officer wou ld not want to be working alone in any business establishment. If a securit y company charges $70.00 per hour, for one security officer, that cost will have to be passed onto the customer by the business. And if you are watchin g your dollars, as a business owner, you are not, gonna spent $500 to $1,000 every week on security if you feel the risk is low. On the other hand, some would say that police shoul d not be paid from the public purse to provide services to businesses. So we now have to perform a balancing act, cause seniors who live alone and must conduct business are also un-protected….I wonder why no encouragem ent by the leaders of this country is heard or said publicly to our polic e officers. 2012 the oba had all the answers, they had the magic wand. Fool me once. Shame on you. Wait a moment, how many times were the Progressive Labour Party voted into “power”? Or do you need to be reminded? So the PLP fooled you 3 times. The OBA hasn’t fooled anyone, they are working hard for Bermuda…you’d have to be blind not to see it. oba is not working for Bermuda. That ridiculous group is working diligently to FILL THEIR OWN POCKETS!! YUP!! That group is working HARD. Working hard to destroy Bermudians and create some F—– up new soci—!! May thos people continue to “WORK HARD!” BAH….HUMBUG!!! This is not a Government problem. WHATEVER HAPPENED TO THE USE OF SECURITY CAMERAS??? How BASIC and OBVIOUS are those to help solve these crimes???!!! !